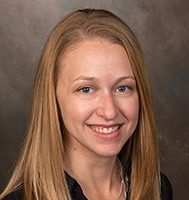 Christa Pittner-Smith, MD, a 2015 graduate of the UW Department of Family Medicine and Community Health’s (DFMCH) Madison residency program who now practices at the UW Health Cottage Grove Clinic, is developing curriculum to give medical students essential skills to transition into family medicine residency. Dr. Pittner-Smith is creating the family medicine portion of the UW School of Medicine and Public Health’s (SMPH) internship prep course, a new two-week required course that students will complete in the spring of their fourth year. The course provides high-level, specialty-specific skill preparation, with a focus on topics that are critical in the first months of residency. Several course sessions are part of a core curriculum for all SMPH students, or shared between medical students entering pediatrics or internal medicine residencies. For the family-medicine–specific portion of the course, Dr. Pittner-Smith plans to include workshops and lectures on patient-physician communication, integrative health, pain management, point-of-care ultrasound and obstetrics life support, among other topics. Using facilities at the UW Health Clinical Simulation Program, students will also practice skills for hospital cross-coverage and role-play communication skills. Much of the course teaching will be done by DFMCH residents, thanks to a medical student teaching elective Dr. Pittner-Smith created with the Madison residency program. DFMCH faculty and fellows, along with a nurse practitioner from the family medicine hospital teaching service and colleagues from the School of Pharmacy will also teach in the course. Dr. Pittner-Smith, who also enjoys serving as a longitudinal teacher-coach in the SMPH’s new ForWard curriculum, says that being a recent resident herself is as asset as she develops the internship prep course. Although the internship prep course is part of the ForWard curriculum, it will be offered to current fourth-year SMPH students this spring.